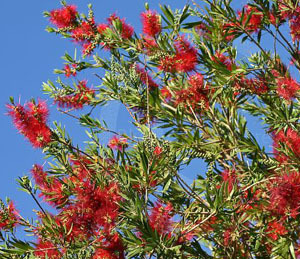 Bottlebrush Tree, (Callistemon) is a native of Australia, but is widely found in south Florida as an ornamental tree with very interesting blooms that look a lot like those rounded brushes used to clean the inside of baby bottles. They reach to 20 or 30 feet and do best in full sun. They prefer well drained soil and are drought tolerant. The bright red 4 inch blooms, arranged in cylindrical clusters, attract bees, hummingbirds and butterflies. Propagation is from seed or cuttings. Pests include mites and scales. There is a weeping version named C. viminalis whose leaves smell like citrus when crushed.